A reed sensor uses magnetic fields to open or close a switch. Unlike solid state, or other mechanical switches, a reed sensor consumes zero power as it operates based on the flux of the magnetic field. The reed sensor was originally developed at Bell Labs in the 1930’s by Dr. Ellwood. The first devices were made using two flattened pieces of ferromagnetic wires that resemble reeds, hence the name. The reeds are hermetically sealed in an enclosure, typically glass. Modern reeds are made from plated wires which can be used to make switches as small as 0.025 inches up to 3 inches. 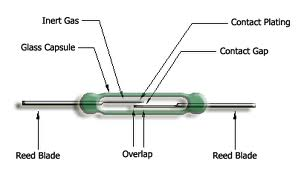 The most common implementation is for a reed switch that is normally open. In this configuration, the two reeds are separated by an air gap and close to make contact only in the presence of a magnetic field. This type of switch is called a “Single Pole Single Throw Normally Open” (SPST-NO) switch or “Form A” switch. You can get a pack of 10 switches for about $2 on Amazon: 10W Low Voltage Current Normally Open Magnetic Switch 2x14mm . These are great to experiment with for Arduino projects. It’s also possible to create a switch element that is electrically conductive (e.g., closed) in the absence of a magnetic field and which opens when the magnetic field is applied. This configuration requires the addition of a nonmagnetic contact. This type of switch is called a “Single Pole Double Throw” (SPDT) switch or “Changeover” switch. It’s important to note that this is a “break-before-make” switch – meaning that the closed contact opens before the open contact closes. Also through Amazon, Reed Switch Magnetic Induction Switch Electromagnetic N/O N/C SPDT Glass Seal CYT1023 10-pack for about $14. In both cases above, the state or position of the switch returns to its original starting state when the magnetic field is removed. The restoring spring force inherent in the reeds is sufficient for the reeds to resume their original orientation. Reed sensor designs are finding more applications as engineers look to methods to reduce power usage when possible. This technology makes it possible to develop new products which consume zero power. If you found this article interesting and informative, please be sure to sign up for our daily Best Tech email.